9 famous Americans in png format. This set includes all of the Americans pictured in the thumbnail preview and also black line masters of each. Easy to layer and resize in your commercial or personal products. 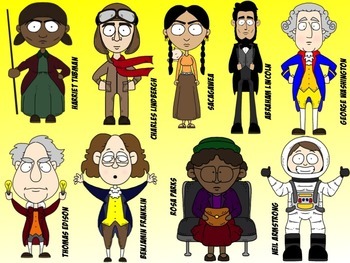 Enjoy George Washington, Abraham Lincoln, Sacajawea, Charles Lindbergh, Rosa Parks, Neil Armstrong, Benjamin Franklin, Harriet Tubman, and Thomas Edison. Someone missing from the set? Want to see other famous Americans. Request someone by contacting me in the "Ask a seller a question" section.